In today’s episode, you will learn what a podcast media host is, what to look for when choosing one and how much do they cost? –A podcast media host is where you upload and store the final media files for your podcast. The most common podcast media file is an mp3 audio file, but for some could be PDFs, or video files if you are a video podcast. –Each time you publish a new podcast episode, you upload your mp3 audio files to your podcast media host where it is stored alongside all of your other episodes. When someone opens up a podcast app on their mobile device or computer and downloads one of your podcast episodes, it is the podcast host that serves up the file to the pod-catcher app. –Podcast media hosts are quite similar to website hosts which store all of your website files and media. Every time someone visits your site, it is your website host that serves up the necessary files to the website visitor. –Podcast media hosts also include other podcasting services such as creating RSS feeds, statistics, podcast web pages, etc, but, for simplicity sake today, think of a podcast media host as the home or online storage for your mp3 audio file that you have recorded, edited and want to share with the world as a podcast. –Every podcast has an RSS feed that you submit to Apple Podcasts/iTunes and all of the podcast directories like Spreaker, TuneIn, Google Play, Spotify, etc. –The RSS feed is created either by your media hosting company or by a plugin on your website which is how I do it, but just know that every podcast has an RSS feed. –Every Friday morning I publish a new episode on my website and upload an mp3 file to my media host. –The RSS feed that magically distributes my new episode to Apple Podcasts and several other podcast directories and also sends a notification to all of my subscribers that a new episode has been released. –When a listener opens up their Apple Podcast App or pod-catcher of choice and downloads or press play on my podcast or any podcast, the podcast media host gets the request and pulls the episode out of storage and allows you to download and/or listen. –The podcast media host is the storage facility for all of your podcast episode mp3 files is stored and every time your podcast is downloaded from any of the many directories it is listed in or on your subscribers’ pod-catcher app, your podcast media host serves up your mp3 file so the listener can download and listen. It is the warehouse that is always on call and ready to zip out the file whenever it is requested. AKA, What makes a good podcast host? Choosing a media host is a really important decision for new and experienced podcasters and it can be a little overwhelming as there are a lot of choices and it can get confusing if you really do not know what you are looking for in a good media host. You want a podcast host that you can trust and depend on because you work hard on your podcast and you want your listeners to have a seamless experience when they want to listen to your podcast, right? Longevity & Dependability. You want a podcast host that has been around the block and has stood the test of time. You want to choose a company that has a good reputation and is financially stable. You want them to stick around for the long-haul and know that you can depend on them. There are a lot of really cool and hip podcast hosting solutions that appear out of nowhere and many are even free, but they have no proven track record and you really do not know their business model or if they will be around next year, and I would steer you away from that. It can be a real pain to switch podcast hosting companies so set your self up for success and choose a host with some skin in the game. Flexibility & Expandability. You want a podcast host that will grow with you and be there for you as your show gets popular. Back to financial stability, you want a podcast host that is invested in podcasting and dedicated to providing state of the art podcast servers can handle heavy traffic and downloads and provide unlimited bandwidth so when Tim Ferriss or Leo Laporte gives you a shout out, your podcast downloads will not miss a beat. Affordability. Price matters. You want to find a podcast hosting solution that fits within your budget so you can produce and maintain your budget for the long-haul. What Podcast Media Hosts Do I use? Mike Murphy Unplugged, I pay Libsyn $15/month to host my podcast mp3 media files. I also pay $15/month to Siteground to host my WordPress.org website. I use the free plugin Powerpress by Blubrry to generate my RSS feed and publish my podcast episodes each week. This is a very common setup for many podcasters to pay for each separately, but it is not the only option and not the most affordable option either. 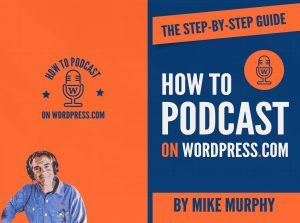 For my new podcast: How To Podcast on WordPress.com which is the companion podcast to my new eBook of the same name, I am using WordPress.com, which is both a podcast host and website host combined. I wrote this eBook was to spread awareness of WordPress.com as a podcast host because many people do not realize it is both a podcast and website host. I am on the personal plan on WordPress.com which is $4/month which gives me a dedicated podcast host and website host with unlimited bandwidth for both, so it can handle traffic and downloads. The $4 plan does have some limitations such as storage space limits and the themes are not as customizable, but you can upgrade at any time and for $4 more per month, you have access to all of the premium themes and double the storage space. I may upgrade eventually, but if you are just starting out, the $4/month plan is a good value. WordPress.org is not a podcast host and you do not want to host your own podcast files on a WordPress.org website. WordPress.com is not the only game in town if you want If you like the idea of paying one price for both podcast and media host combined. Squarespace.com is currently $18/month if paid annually to host both your podcast and website on Squarespace with unlimited storage and bandwidth which is good, but there are some limitations on the RSS feed to consider, so do your research on Squarespace podcasting before you go that route. Here is a list of some podcast media hosts with links to their website for you to research and compare pricing and features.